And I did it. woo hoo! 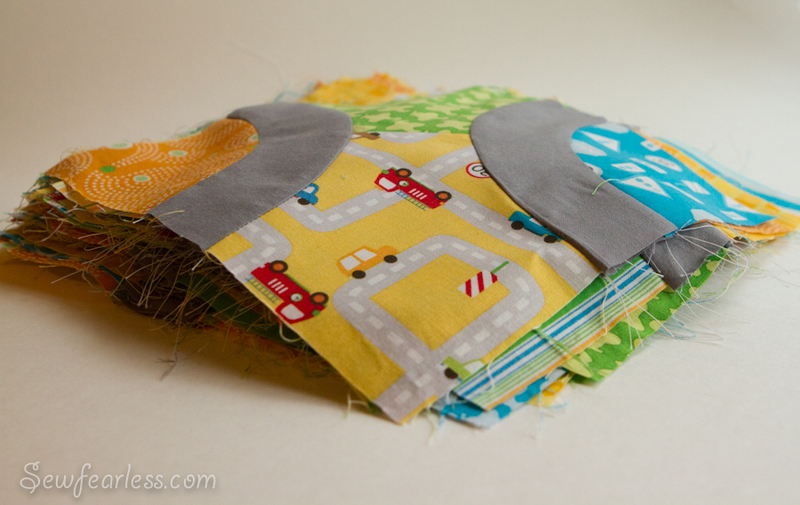 I thought I would share what I learned, because I found it difficult to find information about how to quickly and accurately cut out all those pieces and then sew them together. Disclaimer: I wouldn’t consider myself a “quilter” as I this is only the second quilt I’ve ever worked on. I don’t really know the “right” way of doing things. I would welcome any tips and suggestions from you if you have any. Previous posts about this quilt project are posted under the “quilting” category. 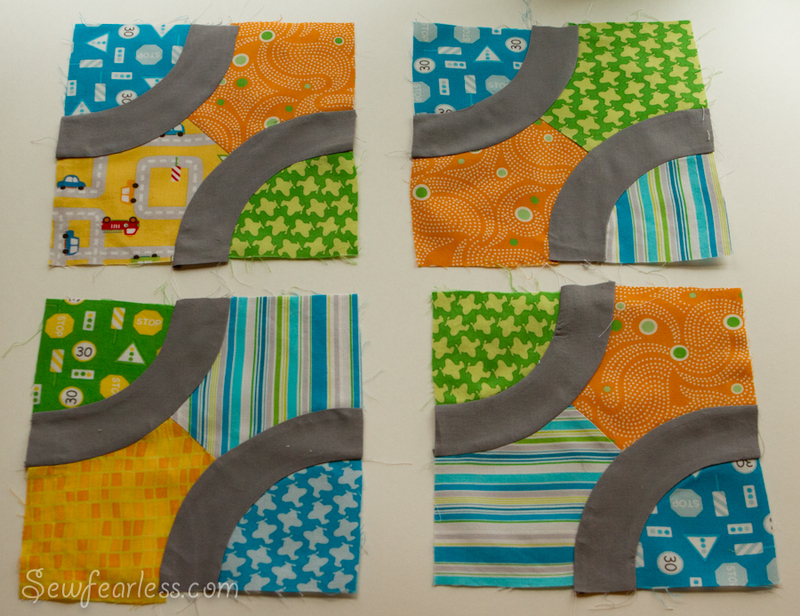 I asked as many quilters as I could, how to cut out these pieces, but I wasn’t satisfied with the suggestions I was given. The most common one was to use a rotary cutter. I don’t know about you, but I am rotary-cutting-on-a-curve challenged. There must be some secret to it that I am not aware of. 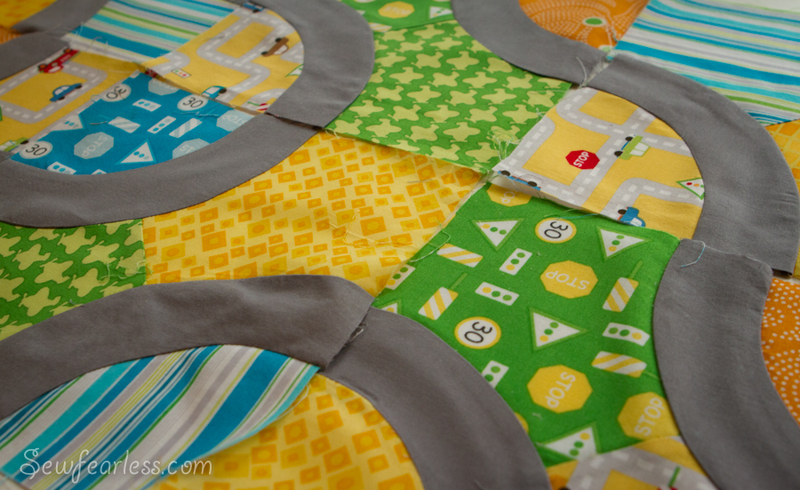 Other quilters swear by the Accuquilt Go! die cutter, but there isn’t a die available for this “Roads” pattern. It certainly would have been nice for accuracy and ease though. The method that worked best for me was to trace the templates onto freezer paper, à la The Train to Crazy, and iron them down to the fabric. I cut through 4 layers at a time and held the layers together with pins. 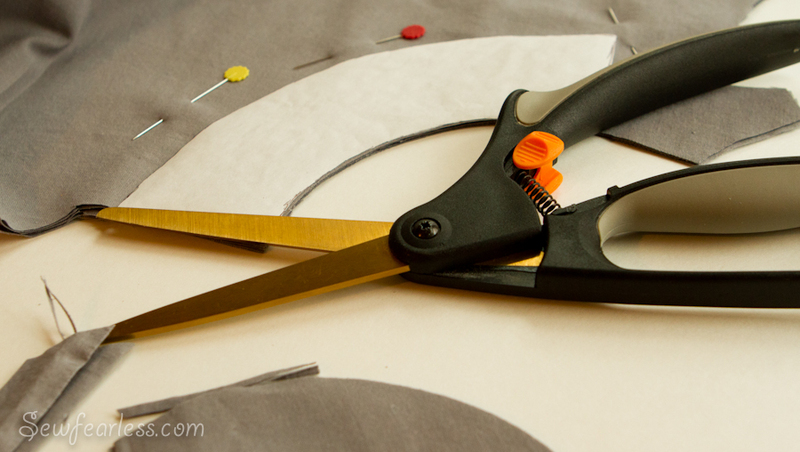 Spring-loaded flat-bottomed scissors helped fight fatigue. 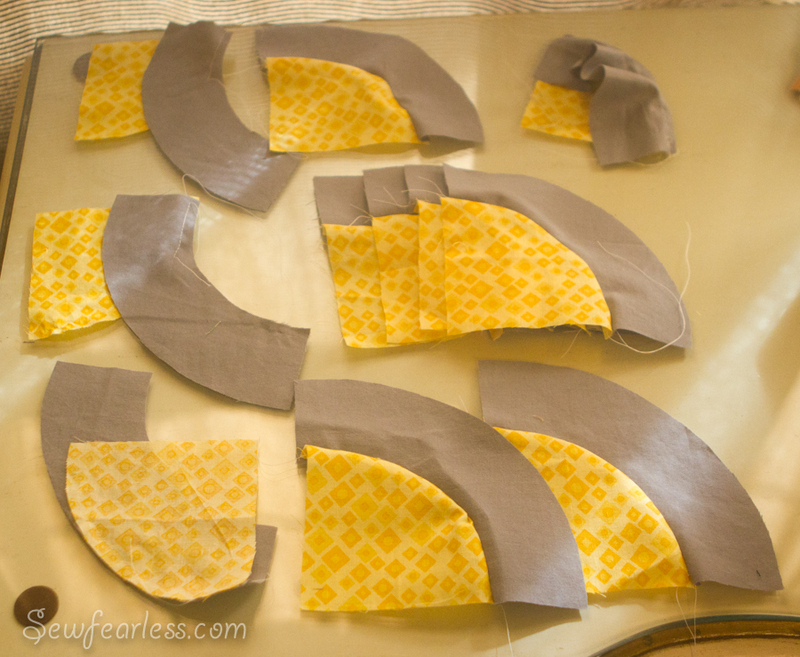 The classic way of piecing curves is rather time-consuming and uses a lot of pins. I love me some pinning, but One Girl Circus pointed me towards the Curve Master presser foot. Watching YouTube videos of it in action, like this one by The Crafty Gemini, sold me on it. 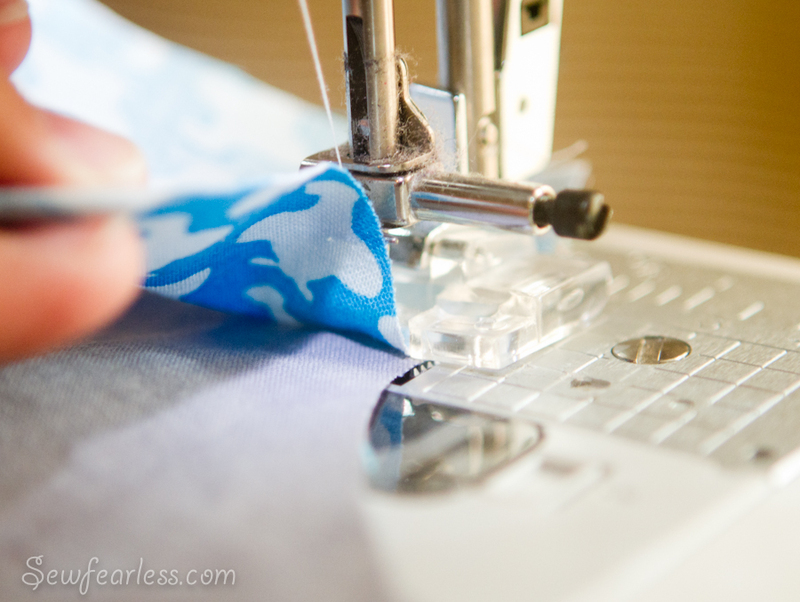 This handy little guy can be used with any sewing machine and includes adapters for most. The suggested adapter for Brother machines didn’t fit mine (a Innovis NX-450), but I was able to snap the foot on without an adapter. This method is definitely easier than painstakingly pinning all of those pieces, but it did take some practice to get a hang out it. The picture below shows my first few tries at it, starting at the upper left and going down from there. I definitely goofed up a good several times and had to pull out the seam ripper. I also had to go very slowly at first, but I was a little faster by the end. Some of my pieces didn’t line up that well. Inexperience and cutting inaccuracy are the likely culprits. 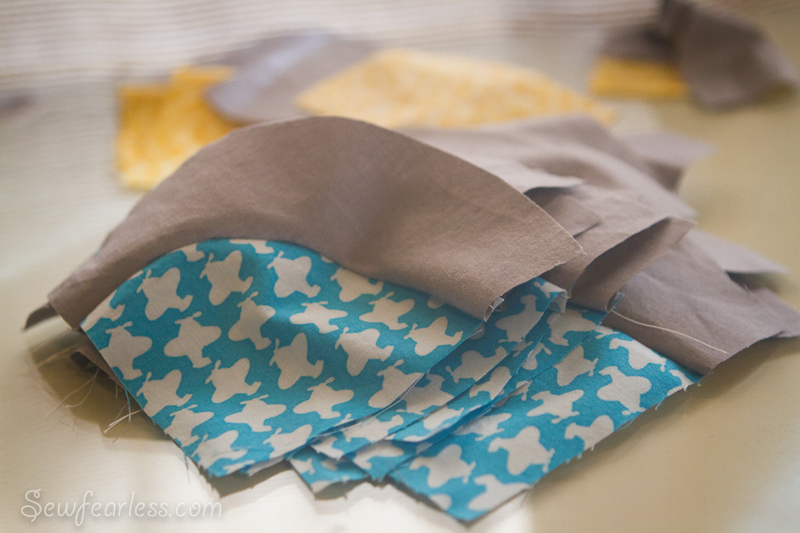 Here are some less than perfect pieces after ironing. I’m not sure what I should do with the blocks next, especially the non-square ones. Do I try to trim them up before piecing them? Tips on how to do this would be awesome. Up next? I get play around with block layouts. I think this is called “auditioning” in quilt-speak. 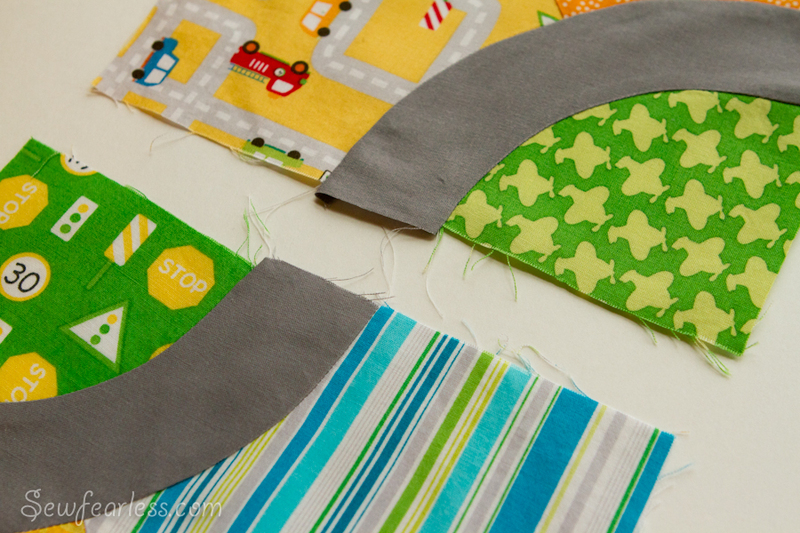 Have you ever made a curved pieced quilt? What are your tips and tricks? that is the coolest quilt ever! he is going to love it! This is great! I can’t wait to see the finished product! I am definitely interested in the curvemaster foot… so neat to hear how you liked it! It is apparently also handy for setting in sleeves… ?? Thanks for another real and beautiful post! Love it! ooohhh.I didn’t even think about the sleeve setting possibilities, but that would be a great use for it! I loooove your header! The picture with Wonder Woman and the needles is just priceless! I am very excited about that presser foot. I look forward to seeing your quilt too, that’s just fabulous! thanks SO much for giving me some tips. I think I will trim them up a bit before sewing. I am looking forward to laying them all out. 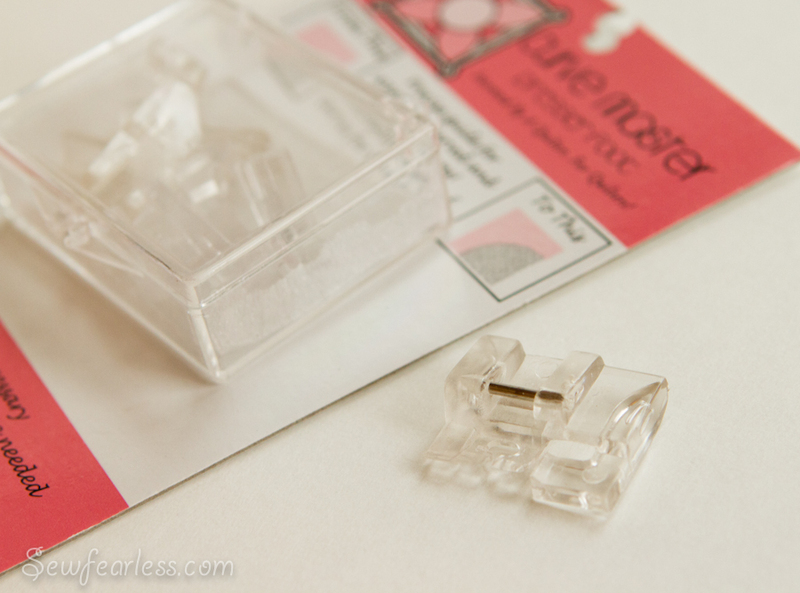 Hi Jodi, thanks for the review of my product, the Curve Master Presser Foot! Here is a special offer for your readers: If anyone orders a Curve Master at http://www.justcurves.biz before the end of November 2011 and mentions in the Special Instructions box of the order that they read about it on your blog, I will include at no charge the Bent Tip Tweezers! Looking at your first pieces, I think I can offer a couple of suggestions which will make you even happier. I prefer to sew with the convex (outer curve) on top, as it is easier to see everything when the top fabric is lifted up. From your photos it appears you had the concave piece on top. I find that more difficult. Also, Just Curves at http://www.justcurves.biz carries a full set of different size Drunkard’s Path arcs which will allow you to rotary cut your “roads” arcs very quickly and easily. It is really quite easy to rotary cut curves! Just like using an acrylic ruler and your cutter! Thanks so much, Sandra! I those tweezers do look helpful. I also didn’t think of creative use of other acrylic templates to make the roads. That would have saved some heartache. We live and learn I guess. I hope you get this comment! 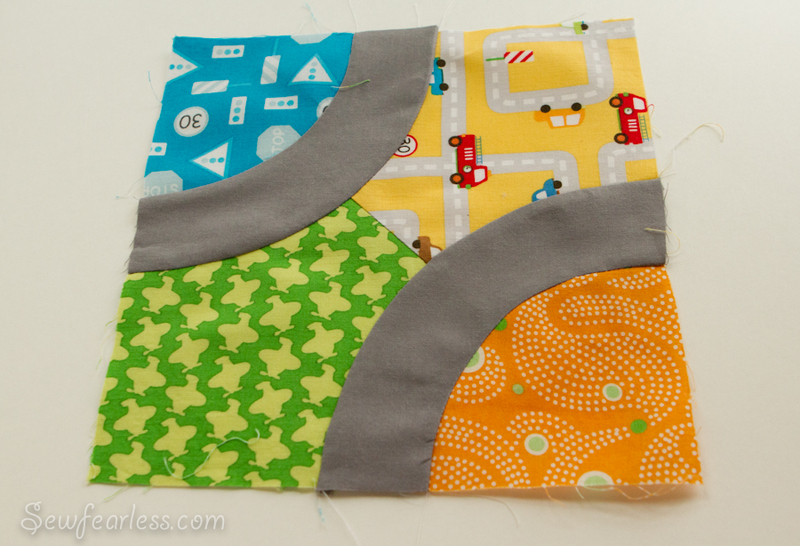 Did you make up the Roads quilt pattern or did you find it elsewhere? I’d love to know how to cut it out. Thanks! I got it from the Encyclopedia of Classic Quilt Patterns. Love the pattern and curvemaster. Where did you find the pattern? What is the name? How many different fabrics did you need to use? Thanks! I have been “volunteered”to do a quilt for my granddaughters school benefit. I want to do kids handprints on curved pieces in a rainbow. Do I cut them out on the bias? I really don’t know. Are you making many little rainbows? or one big rainbow?